This Know Your Rights guide is the fourth in a series aimed at helping you understand your legal rights to free expression and privacy. The Know Your Rights series is partially funded by IFEX and the Law Foundation of British Columbia, and is part of PEN Canada’s Canadian Issues program. A special thank you to Patricia Snell and Stockwoods LLP for their legal and research support on this guide. Access to books in prisons plays an important role in the rehabilitation of inmates. Literacy and education levels in prisons are much lower than that of the greater Canadian population, and libraries and book clubs in prisons are vital for these populations. Access to reading material also helps inmates follow and stay connected to what is going on in the outside world, and encourages social and mental stimulation. However, due to budget cuts and other regulations, many federal inmates have limited or no access to books. A 2003 study found that Canadian inmates were “information-deprived” with limited quality material available to them, but little was done to address this issue. 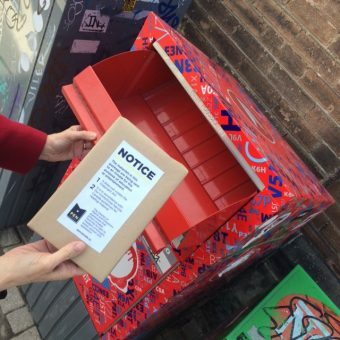 There have also been reports of prisons confiscating books sent to prisoners without clear reasons. Federal correctional institutions, which are managed by Correctional Service Canada (CSC), are able to determine which material they will allow for inmates to use. But the powers of prison authorities are also subject to the Charter of Rights and Freedoms which guarantees inmates the right to freedom of thought, belief, opinion and expression, unless lawfully restricted by their sentence. 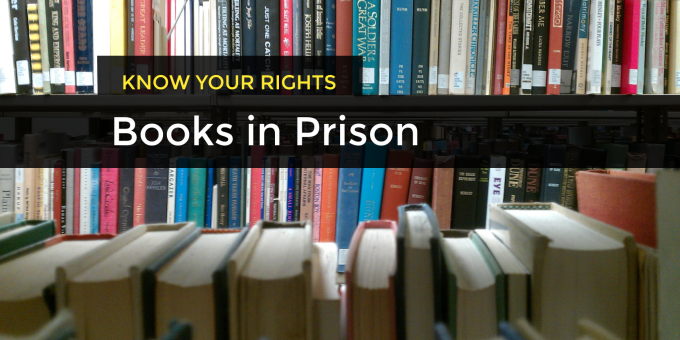 This guide explains the rights of prisoners to access books. It is not legal advice. If you’re sending books to prisoners, use this mailing label outlining prisoners’ right to read. What are the rights of prisoners? Inmates retain all rights enjoyed by other members of society, except for those that are necessarily removed or restricted by the fact of incarceration. For example, prisoners lose the right to come and go as they please, but they do not lose their Charter rights of freedom of conscience and religion, or freedom of thought, belief, opinion and expression. The limit must be fair and not arbitrary. It should be carefully designed to achieve a permitted objective, and rationally connected to it. The means should impair the right as little as possible. There must be proportionality between the effects of the limiting measure and the objective. The more severe the negative effects of the limit, the more important the objective must be. Additionally, according to a CSC directive on libraries in prisons, libraries should offer resources comparable to other libraries in the community. They must provide material that meets the needs of minority official language inmates, and must also have available copies of historical and current legal references, such as the Canadian Charter of Rights and Freedoms and the Criminal Code of Canada. However, reports have shown that quite often, these directives are not adhered to. Do all inmates have the same access to reading material across Canada? what a prisoner can receive through the mail, prison reading programs are sometimes the only source for reading material. Some correctional facilities have lost staff librarians due to recent funding cuts, resulting in the closure of previously existing libraries. As a result, they depend exclusively on volunteer efforts to manage the library service or run book clubs and literacy initiatives. How can I send reading material to inmates? Most correctional facilities will allow letters, postcards, and a limited number of pages from books or magazines to be mailed to individual inmates. At most facilities, complete books and other reading material are not permitted to be sent directly to an inmate, but some will allow books mailed directly from the book publisher or distributor. Contact the specific facility you wish to send it to for more information. A directory of national facilities can be found here. You may donate books to the CSC by contacting them by email at BookDonation@csc-scc.gc.ca. There are also many national and local organizations that work within prisons to distribute books and other materials directly to inmates. John Howard Society, the Elizabeth Fry Society or Book Clubs for Inmates are just some of the organizations that accept book donations. What are the guidelines for permitted material? Books should be in good condition, not worn, old or covered in writing. Books should not have CD-ROMS attached or be textbooks. The book should be legally available. It should adhere to the legal requirement of the Copyright Act. It should not present a threat to the security of the institution or people. It should not contain information on the fabrication of weapons or on criminal acts. It should not promote hate of any identifiable group, e.g. race, religion, sexual orientation, or by other specific traits. It should not be sexually oriented involving violence or coercion, or involving children. Materials that portray excessive violence or aggression, or are sexually oriented in a criminal fashion, are also at risk for prohibition. Keep in mind that correctional institutions may confiscate material if they deem it a threat to personal or institutional security. Can I send photocopied material to an inmate? You may mail a limited amount of photocopied material to an inmate. However, there have been incidents of prison guards returning photocopies of copyrighted material, claiming a violation of the Copyright Act. Under the “fair dealing” exception to copyright infringement, photocopies for private use are legally permitted. While the removal of material deemed a threat to the security of inmates is permitted, Commissioner’s Directive 764 allows “appropriate access” to most materials within correctional institutions. Send no more than 10% of a published work, or no more than one single article/play/essay/reference from a periodical, book or other published work (whichever is larger). One chapter from a published book is permitted as long as it is no more than 20% of the book. Send no more than one article from a newspaper published over a year earlier. Send no print music, study guides or course packs or letters to the editor. The copy that you send must be for private research or study only. What can I do if I suspect that an inmate is being refused access to reading material? You can get in touch with the correctional facility directly and speak to the administration about your concerns. An inmate may also choose to file a grievance with the CSC, which can be taken up to local, regional or national levels. If the CSC grievance process fails to address the issue, the inmate or someone on behalf of the inmate may also file a complaint to the Correctional Investigator of Canada. To increase the chances that your reading material will be permitted, use this mail sticker on any package you send. Download the mailing sticker pre-formatted for Avery 5163 mailing labels here. 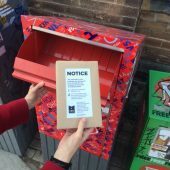 Use this mailing label to send books to prisoners.